After years of rumours (and an ill-advised Amazon TV series) a sequel for the cult survival-horror comedy, Zombieland, is finally happening. At last weeks CinemaCon in Las Vegas, ComicBook reported that they spotted the Zombieland 2 logo during a Sony presentation, which also included announcements for Bad Boys III and Blade Runner II. The original was released in 2009 and starred Woody Harrelson, Emma Stone, Jesse Eisenberg and Abigail Breslin. Though it’s still in the development stages, Rhett Resse and Paul Wernick (the same guys who wrote the said ‘ill-advised’ TV series) are attached to write the sequel’s screenplay. Now we know that might set off some alarm bells, but bare in mind that both writers also worked on the Deadpool script, and we all now how awesome that turned out to be, so we’ve got high hopes for this one. 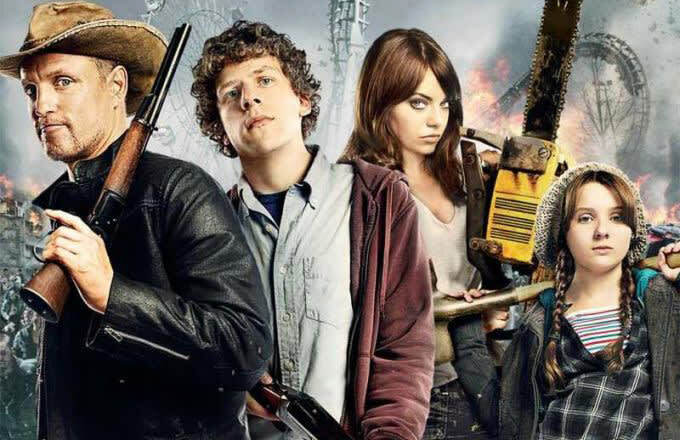 If you haven&apos;t seen the first Zombieland movie yet we highly recommend it.